Sometimes it’s enough to setup your PIV System a single time especially for your task. Sometimes that’s not enough. When it comes to repeating tasks, traversing systems come in handy. When your hardware is difficult to access, or not accessible at all, remote control ability is mandatory. While you could directly go for our RoboPIV solution (which would of course be awesome…), this might bust your budget. 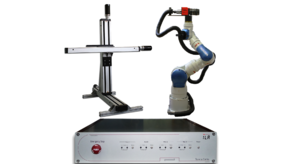 However, it doesn’t directly have to be a full 6DOF robot: Our motorized mounts enable you to remotely (and precisely) control the crucial axis, directly adapted to your existing hardware. Conveniently remote-control aperture and focus of your Canon EF lens via ethernet; No need to physically touch your carefully calibrated camera anymore. The Controller is available for most scientific cameras on the market and can easily be retrofitted to your existing hardware. Add controllable axes to your system. Optical systems rely on accurate repositioning. Being able to use the same calibration for different positions is not only a big time-saver, but also a first step towards automation. From a single axis up to a multi-axis system, we can offer you traversing solutions in flexible configurations. As always conveniently controllable over ethernet and through the supplied GUI. Special (half-)automated solutions are available as well. Just talk to us! Compensate perspective blur. Stereo-PIV works by looking at a plane under an angle. To compensate the resulting optical effects, the different planes must be aligned properly. This is done by matching the “Scheimpflug”-condition, therefore tilting the lens with respect to the camera. Here, multiple combinations are possible: from “all mechanical” to “all motorized”, we can offer you everything in between. As with our EOS Controller, retrofitting is possible for most cameras; why not upgrading your camera with a mechanical Tilt Mount and a motorized EOS Controller?